I wanted to write a blog post that questioned crafting, all the things we make in our homes in a world that is over abundant with stuff. I lost my courage as soon as I went on-line. I still want to make everything I see. I think I was feeling guilty for having so much, and not using it wisely. I didn’t have the will power to control my spending on one of the Black Friday sales either. I ordered some embroidery designs which were like 60% off. They will be here on Friday. Hopefully I will have something to show you all next week. This change thing I have been doing for the past 2 1/2 years has been very difficult at times. I am keeping the weight off, and my Lupus symptoms are pretty much gone. From what I have read about changing habits, I have about 18 more months to be diligent. Actually I think I have to be diligent for the rest of my life. Exercise has taken a lot of time from my crafting. On the plus side my dowager’s hump is mostly gone. I didn’t think that was possible, but doing the spine straightening exercises daily worked. It took over a year though. Being slumped over craft work messes with the lungs too, by compressing them. So many ladies in my knitting group suffer from health problems that could be related to crafting too much, like I did. Maybe that is one reason I am questioning my devotion to crafting and blogging about it. Both require so much sitting time, plus I tend to snack more when I am involved in either. There is all the time, all the skills I have developed, all the supplies I have yet to use that would be wasted if I don’t figure out a way to exercise and craft. Does any of this make any sense, or have I truly lost it? Am I worrying needlessly? On to other things. Below is another photo from our Disneyland vacation. 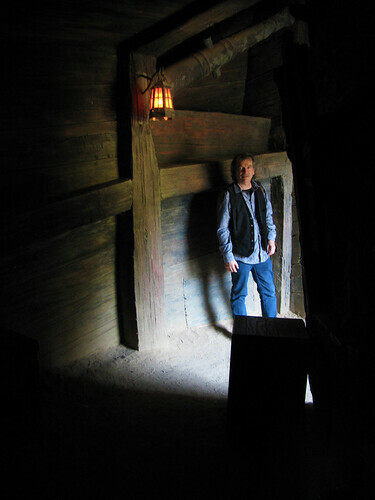 Rick has a photographer’s eye and he pointed out this spot as we were walking through a Pirate’s Lair cave on Tom Sawyer’s Island. I asked if I could take the photo. I think he would have taken a better photo, but you all can get an idea of what type of places to look for. One where the light is coming into the surrounding darkness. I was just walking trough the caves not looking, just thinking. I think I live in my head too much of the time and miss things that are right before my eyes. This has been a really whiney post. I am going to blame it on the rain. It always makes me a little moody, and I wanted to post today rain or shine. This entry was posted on Wednesday, November 28th, 2012 at 4:50 pm and is filed under Craft, Disneyland, Life and Photography. Tagged: Craft, Disneyland, Life, Photo. You can feed this entry. You can leave a response, or trackback from your own site.